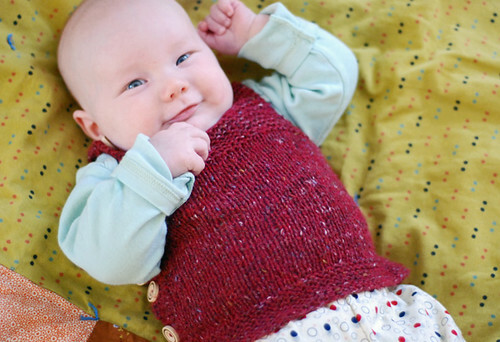 Harper's vest | Flickr - Photo Sharing! beetgreen, prettiest.teacup, nessavay, and 2 other people added this photo to their favorites. Its those amazing eyes Blair! And you can see that little bit of a mischevious grin sneaking in that all of your little sweets have. Wait. Wasn't he born just yesterday?! So big already and absolutely fetching in his new vest. Also, I may have said this before but your and your man's DNAs combine in amazingly consistent ways. OH MY GOOOOOOOOOOOOOOODNESS That 's the sweetest little face around!!!!!!!!!!! so cute!!!!!! So cute. Does he have a date for the prom yet? So flippin' cute. I so wish this pattern had been around when the boys were babies. I suppose, though, that it'd be pretty easy to upsize it for E.
oh GOODNESS!! precious. the whole package! oh, look at him all round and smiley! so adorable! oh wow! his smile is sooooooo sweet. I'm sure his smile always melts your heart and brightens up your day. He has those almond eyes! But in blue. Now that is one happy, contented, well-loved baby! Lovely. he looks so good- and i think he knows it! good golly. that is one cute baby.